Flappy Bird is officially no more. True to the word of the game's creator, Dong Nguyen, the app is gone from both Google Play and the iTunes App Store. Unless you already downloaded it, you won't find one of the world's most popular video games anywhere. Nguyen apparently recoiled from the notoriety his game received over the past couple of weeks. Flappy Bird had been atop the iOS most-downloaded chart for some time, but once mainstream American press noticed it, the game became another catalyst for video gaming's neverending treehouse debate over what constitutes a real game and whether a mobile title deserves a place in the discussion. 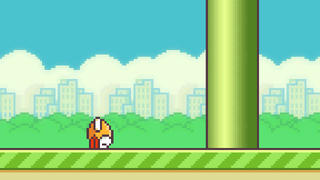 Flappy Bird's barebones style and derivative quality, particularly its visuals, also animated its detractors. Nguyen, though, last night told a fan that there was a different reason for the game's removal. Here, "overusing" seems to mean "abusing" or "addicted to," but it's hard to say for sure. Shuriken Block, along with three others—Smashing Kitty, Droplet Shuffle, and Ninjas Assault—can still be played on a mobile device with an HTML 5-enabled browser through his studio's home page. But Flappy Bird is now gone, apparently forever.